Custom made hair pieces for men, woman and children. Natural, cool and comfortable and made to suit your real hair. 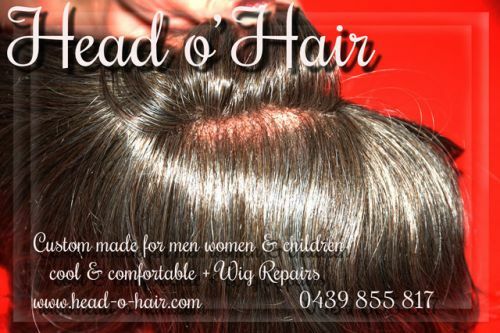 At Head o' Hair, we specialise in making custom made pieces to suit your needs. Head o' Hair makes your wigs and hair pieces very comfortable and secure to wear. Wig modifications and wig repairs are also available. Application We provide very easy and non messy application. Very secure and comfortable for day and night wear. Using our application, you will be so comfortable you will forget about being in the wind. You would even be able to swim without fears. We'll teach you how to apply and have the best results. Hair thickness, hair colour and age are all factors that need to be taken into consideration when creating the perfect hair piece. To create a natural looking piece, grey and other colours can be included in your piece. Each person has different needs so we make sure to consult with you and find the hair that best suits you. Based in Ingle Farm. Provides a mobile service to you in Adelaide South Australia.